Black Fate was formed in 1990 in Larissa Greece by Nikos & Elias Tsintzilonis, Heracles Fanarakis and Stelios Papakostas. They released two demos called “Black Fate” and “A Piece of Dream” which earned great reviews from the Greek metal media and the band started playing their first shows. In 2000 after a few line-up changes the debut album “Uncover” was released by Secret Port Records and two years later the two first demos were also re-released together on an album with the title “A Piece of Dream”. In 2007 Nikos Tsintzilonis met Vasilis Georgiou and decided to put Black Fate back on track. They started working on new material and writing new songs for a new album and began to make plans for a new beginning of the band. The result of all this work was the album "Deliverance of Soul" that was released in 2009 by Asiral Records. After the album release the old line up couldn't follow the bands live obligations and the search for new band members started. After some searching Black Fate recruited guitarist Gus Drax known for his presence in the progressive metal band Biomechanical from the UK, and also from Sunburst and his solo album "In Search of Perfection". 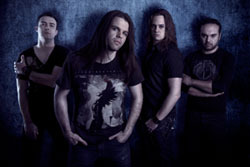 Vasilis Liakos from the band Innosense also joined Black Fate. Together with vocalist Vasilis Georgiou and founding member and drummer Nikos Tsintzilonis the band was full again and started playing shows in support for "Deliverance Of Soul". The shows went great, and Black Fate decided to keep on playing together and started working on the new album. After much hard work for 2 and a half years of composing and demoing ideas the band locked themselves in the studio and recorded 10 brand new songs for the new album. This time with 7 string guitars the band went for a heavier but still very melodic style, combining modern and old school influences like Kamelot, Iron Maiden, Conception, Dream Theater and others while striving to create their own identity and mark as a band. Black Fate recorded all drums, bass and acoustic guitars for the album in Warcry Studios in Larisa. All guitars and vocals were recorded at Gstudio and Hall studios. The album was mixed by Nikos Tsintzilonis in the Gstudio and was mastered by Eric Tordsson [End of September, Antestor] at Solid Mix Studios in Sweden. A deal was inked with the Swedish label Ulterium Records and the new Black Fate album “Between Visions & Lies” is scheduled for a released on November 28th in Europe and December 2nd in North America. Inspired by the giants in the genre, Black Fate have managed to create a very memorable album filled with crushing guitar riffs, haunting melodies, furious technical and melodic solos and songwriting that will satisfy even the most demanding metal fans. Led by the incredible vocalist Vasilis Georgiou and the very talented young guitar player Gus Drax, Black Fate are ready to make a mark in the metal scene!